Two identical rustic holiday cottages each offering accommodation for groups or families up to 8 persons. 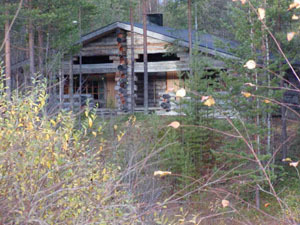 The self catering cottages are in one big log cabin located in a wooded area just 200 metres to the slopes and the hotel in Suomutunturi, Northern Finland right on the Artic Circle. You can spend your holiday with outdoor activities, including hiking, fishing, hunting, picking wild berries and uncrowded skiing. 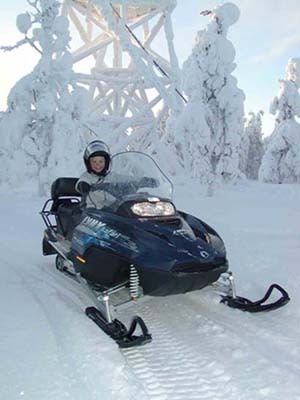 Attractions also include husky, reindeer or snowmobile safaris. Or just relax in the peace and quiet. The kitchen is open plan to the sitting room area offering elec oven, fridge, microwave, coffee machine, water boiler, toaster and dishwasher. The bedroom has a double bed. Double sofa bed in the living area, additional sleeping on the loft with 4 mattresses. You can step into your own sauna after the outdoor activities. The cottage is electrically heated. There is also a fireplace for cozy evening comfort. Other equipment: colour TV, video, radio and a CD and casette player. The cottage is equipped with drying facilities for outdoor clothing and a vacuum cleaner. Prices include bedding (blankets, pillows, matresses), firewood, cooking utensils and tableware. You must bring your own linens and towels. Please contact us for additional information.